Spring is the season for Earthshine on the waxing Moon. April 8 was the perfect night for capturing the waxing crescent Moon illuminated both by the Sun and by the Earth. The phase was a 4-day-old Moon, old enough to be high in the sky, but young enough – i.e. a thin enough crescent – that its bright side didn’t wash out the dark side! In the lead photo at top, and even in the single-exposure image below taken earlier in a brighter sky, you can see the night side of the Moon faintly glowing a deep blue, and brighter than the background twilight sky. The 4-day-old waxing crescent Moon on April 8, 2019 in a single exposure when the Moon was still in the bright blue twilight. Even so, the faint Earthshine is just becoming visible. This is with the 105mm Traveler refractor and 2X AP Barlow lens for an effective focal length of 1200mm at f/12, and with the cropped-frame Canon 60Da at ISO 400, in a single 1/8-second exposure. This, too, is from sunlight, but light that has bounced off the Earth first to then light up the night side of the Moon. If you were standing on the lunar surface on the night side, the Sun would be below the horizon but your sky would contain a brilliant blue and almost Full Earth lighting your night, much as the Moon lights our Earthly nights. However, Earth is some 80 times brighter in the Moon’s sky than even the Full Moon is in our sky. The 4-day-old waxing crescent Moon on April 8, 2019 in a blend of short and long exposures to bring out the faint Earthshine on the dark side of the Moon and deep blue twilight sky while retaining details in the bright sunlit crescent. This is with the 105mm Traveler refractor and 2X AP Barlow lens for an effective focal length of 1200mm at f/12, and with the cropped-frame Canon 60Da at ISO 400, in a blend of 7 exposures from 1/30 second to 2 seconds, blended with luminosity masks from ADP Pro3 extension panel in Photoshop. Unlike the single image, the lead image, repeated just above, is a multi-exposure blend (using luminosity masks), to bring out the faint Earthshine and deep blue sky, while retaining details in the bright crescent. Once the sky gets dark enough to see Earthshine well, no single exposure can record the full range in brightness on both the day and night sides of the Moon. The 4-day-old waxing crescent Moon on April 8, 2019 with it below Mars (at top) and the star clusters, the Hyades (at left, with reddish Aldebaran) and Pleiades (at right) in Taurus, and set into the deep blue evening twilight. This is with the 135mm Canon telephoto at f/2.8 with the Canon 6D at ISO 400, in a blend of 7 exposures from 1/4 second to 8 seconds, blended with luminosity masks from ADP Pro3 extension panel in Photoshop, to prevent the Moon from being too overexposed while retaining the stars and blue sky. The camera was tracking the sky. April 8 was a great night for lunar fans as the crescent Moon also appeared between the two bright star clusters in Taurus, the Hyades and Pleiades, and below reddish Mars. It was a fine gathering of celestial sights, captured above with a telephoto lens. This show the chart I used to plan the framing, created with StarryNight™ software and showing the field of the 135mm lens I used. The chart also shows why spring is best for the waxing Moon. 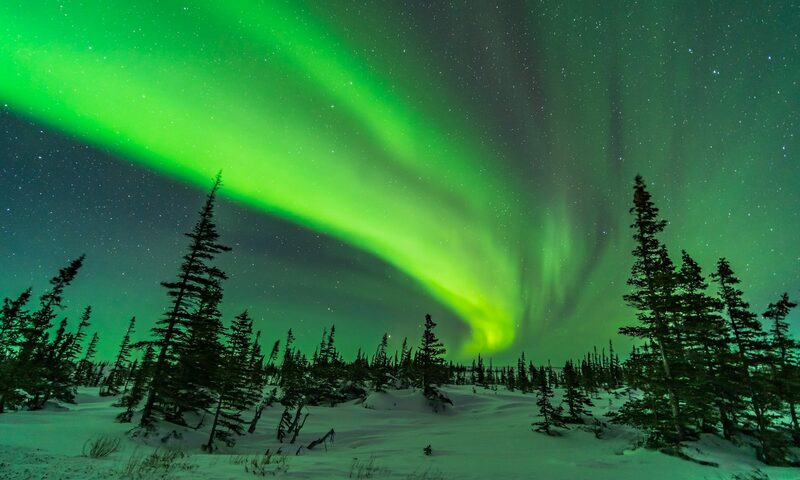 It is at this time of year that the ecliptic – the green line – swings highest into the evening sky, taking the Moon with it, placing it high in the west above obscuring haze. That makes it easier to see and shoot the subtle Earthshine. And to see sharp details on the Moon. The 4-day-old waxing crescent Moon on April 8, 2019 exposed for just the bright sunlit crescent, revealing details along the terminator. This is with the 105mm Traveler refractor and 2X AP Barlow lens for an effective focal length of 1200mm at f/12, and with the cropped-frame Canon 60Da at ISO 400, for a single exposure of 1/60 second. This is not a stack or mosaic. After the sky got darker I shot the crescent Moon in a short exposure to capture just the bright crescent, included above in two versions – plain and with labels attached marking the major features visible on a 4-day Moon. If you missed “Earthshine night” this month, mark May 7 and 8 on your calendar for next month’s opportunities. From the southern hemisphere the Moon appears “upside-down” and higher each night in the northern sky as it waxes from crescent to Full. These are scenes from the last week as the Moon rose higher into the evening sky as seen from Australia. A northerner familiar with the sky would look at these and think these are images of the waning Moon at dawn in the eastern sky. 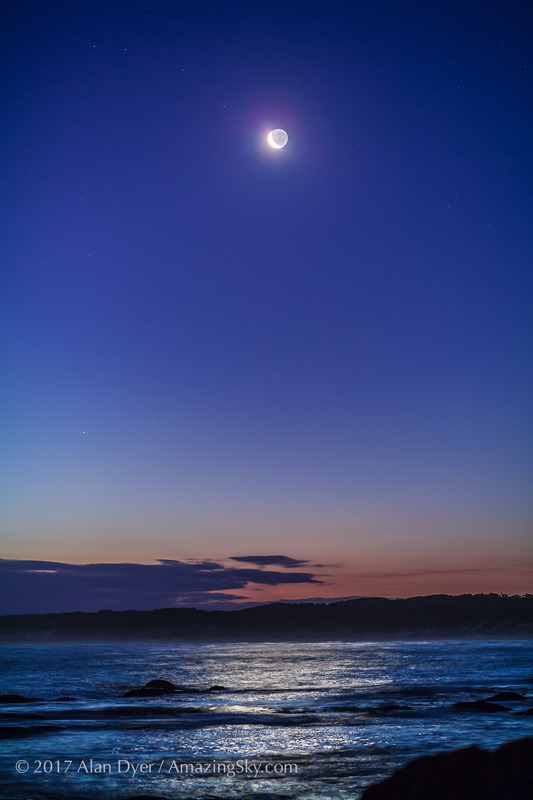 The “upside-down” waxing crescent Moon in the evening sky from Victoria, Australia, at Cape Conran, West Cape area, on the Gippsland Coast, at latitude 37° South. Earthshine lights the dark side of the Moon. This was March 31, 2017. The Moon lights a glitter path on the water. This is a single 1.3-second exposure at f/2 with the 85mm Rokinon lens, and Canon 5D MkII at ISO 400. But no, these are of the waxing Moon (the phases from New to Full) with the Moon in the evening sky. From the southern hemisphere the ecliptic – the path of the planets – and the path of the Moon arcs across the northern sky. So as the Moon waxes from New to Full phase it appears to the right of the Sun, which still sets in the west. The world still spins the same way down under! So the Moon appears upside down and with the crescent phase the “wrong” way for us northerners. A 240° panorama from 16 segments. This panorama taken April 4 sweeps from northwest to southeast, but looks north at centre, to capture the scene at sunset of the waxing 8-day gibbous Moon in the northern sky as seen from the southern hemisphere. The angle between the Sun and Moon is just over 90°, shown here by the angle between the right-angle arms of the wharf, pointed to the west at left, to the north at centre, and to the east at right. The Sun has set just north of west, while the Moon sits 13° east of due north. The Earth’s shadow rises as the blue arc at far right to the east opposite the Sun. A 240° panorama from 15 segments. The next night, April 5, I shot this panorama from Philip Island south of Melbourne. Again, it shows the waxing gibbous Moon in the north far to the right of the setting Sun in the west (at left). Getting used to the motion of the Sun and Moon across the northern sky, and the Moon appearing on the other side of the Sun than we are used to, is one of the challenges of getting to know the southern sky. Things just don’t appear where nor move as you expect them to. But that’s one of the great delights of southern star gazing. May ends with a thin waxing Moon returning to the evening sky. This was the scene on a fine Friday evening, May 30, as the two-day-old Moon returned to the western sky. Mercury was not far away, and is in this frame but at far upper right. I wasn’t really framing the shot with Mercury in mind, but the Moon and clouds. This frame is one of 440 I shot for a time-lapse sequence of the setting Moon and moving clouds. This is the result, nicely deflickered with LRTimelapse software, an essential tool for time-lapse processing. 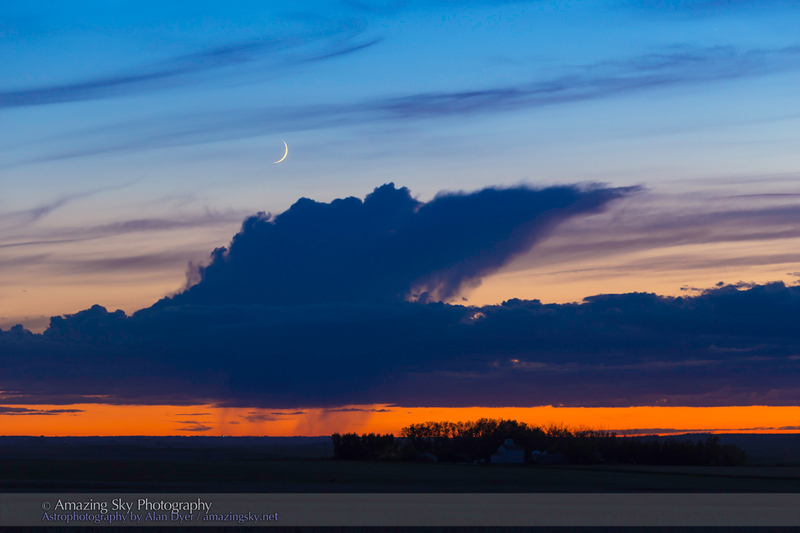 How many times have I tried to shoot the Moon or Mercury low in the west and been foiled by cloud near the horizon? Notice the rain falling from the western cloud. Some place near Calgary was getting wet!